Mio Cyclo 505 cycling GPS features a 3-inch colour touchscreen display, plus its rugged and waterproof design makes it ideal for cycling in all weather conditions. All Cyclo 505 bike computers are preloaded with street-level road maps and depending on the model they include either UK and Ireland or Western European maps. To compliment the system the battery life is 12 hours. Mio Cyclo 505 navigators include an Ant+ and Bluetooth sensor and some models also include wireless heart rate monitor and cadence sensor. It also enables you to receive mobile telephone calls. Plus you can send a text message regarding your location (Android only) and you can listen to music on this device (certain features limited to Android or iPhone - see below). The Cyclo 505 is also WiFi enabled so that you can easily connect to other devices via WiFi. Mio Cyclo 505HC has been discontinued. Accessories, spares and parts are still available for your Cyclo 505. Cyclo 505 is Mio’s premium bike system and provides excellent training and navigation capabilities. The training and performance side of the Cyclo 505 has the capability to use wireless heart rate monitor and wheel/speed cadence sensor. In fact two of the 505 models, the HC bundles, include these as standard saving you money. The navigation side of system can be used for bicycle routes as well as road maps for use in a car. There is also a points of interest database which includes bicycle shops, restaurants and emergency locations. All models have a flat sunlight readable colour 3-inch touchscreen and this device is lightweight, weighing just 129 grams. 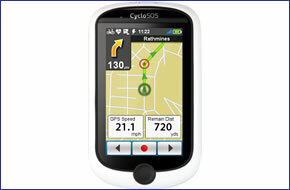 The Cyclo 505 features a simple menu structure and easy-to-use on-screen buttons. Plus, what's more, the 505 device is waterproof to IPX7 standards. It also features a Barometric altimeter and electronic compass assisting you with changing weather conditions. Thanks to a software update in June 2014 you can now connect your iPhone or Android Smartphone to your Cyclo 505 using its now activated Bluetooth technology. This will enable you to receive calls and also see who is calling. Plus, you can read incoming texts. There is a compatible headset with microphone that you can use to wirelessly or use with a wire to receive telephone calls. Whats more on your Cyclo 505 you can even listen to voice instructions using the headset however this feature is only available with Android Smartphones. Another new feature of the Cyclo 505 is that it allows you to play music. There are also buttons for pause, stop and next song. If you want to use the advanced search song feature and go through your playlist you will only be able to do this with an iPhone. Please also note to control the volume you will need to be using an Android smartphone. There is a 'where am I function' that displays on screen your current address and longitude and latitude coordinates. Plus, with your Mio Cyclo 505, if you are using an Android smartphone you can even send a text message to people telling them your exact location. Whats more you can also navigate to a post code or enter coordinates or select a position on a map to navigate to. The Cyclo 505 supports bluetooth and ANT+ heart rate monitor and bluetooth and ANT+ speed-cadence sensors. Plus it also allows connection to ANT+ trainers. Additionally connection to the Shimano Di2 unit (required) allows the user to see gear info during ride and all gear info is saved in history and a GPX file. Mio Cyclo 505 includes Surprise Me feature whereby you enter either your destination, time cycling or distance and then the device provides 3 potential bicycle routes. You can additionally use workout programs from the device for outdoor and indoor use when the weather does not enable you to go outdoors. This GPS device has Wi-Fi built-in for easy transfer of data between the GPS bike system and your computer using MioShare desktop. You can also store data and manage route history and download other users routes. The Cyclo 505 includes bicycle maps allowing you to travel between point A and B or cycle along your preferred route. You can also use the 505 in a car and receive turn by turn directions to your selected bike route. Optional accessores are available including a car charger and car mount. You can also see the elevation details along your route. Furthermore the battery life on this Mio sat nav is 12 hours so you can cycle without concern for running out of battery power. When you buy the Cyclo 505 from ActiveGPS you have everything in the box to get you up and riding (as listed above). There are however additional accessories which are also available to purchase from ActiveGPS. Question: Do you have any spare parts for a Mio Cyclo 505? the locking ring at the rear of my device has sheared at one of the fins and is now loose. Answer: While we sell accessories for the Mio Cyclo 505, we don't sell parts such as the locking ring. Subsequent comment: As it's now out of warranty they wanted £70 to repair it... May end up making a new "fin" myself and trying that. Do you have a question about the Mio Cyclo 505? Submit your question via our contact page.